Football managers as clinical leaders? surely not! The Leadership hub has some more words of wisdom on leadership from the Govan shipyard worker who played a wee bit of football and ultimately rose through the ranks to be regarded as one of the best 5 football managers ever! 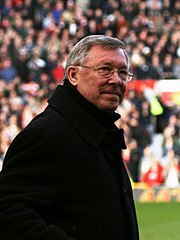 Now, Sir Alexander Chapman Ferguson CBE has many critics and I certainly wouldn’t claim to be a Man Utd fanboy. (You can find my team supporting most of the Scottish League above them.) There is a no denying that the man has had a magnificent effect on the team he took over 20 years ago. He cut his managerial teeth on such well known teams as East Stirlingshire and St Mirren before moving to Aberdeen and then eventually Manchester United. His style is no nonsense and direct, he firmly believes that no individual is bigger than the club and he is renowned for being a strict disciplinarian. Very old fashioned. And yet, as blogged earlier, he has a style that engages players, even those who don’t make it in his team and he gets results seeking out talent and nurturing and keeping them. Ryan Giggs for instance joined the club aged 17 and eighteen years later is still making first team appearances. Something about the team and set-up at the place has retained him whilst others have moved on. Sir Alex’s style must be part of that. It’s not rocket science really, is it? Yet the more I consider it, the more I wonder if football managers have something to teach us as clinical leaders. Although near the pinnacle of his organisation the manager will still be at the shop floor on a regular basis. He must know and interact closely with many people on many different levels. He must delegate and trust the delegated results. He must integrate reports and reviews from many sources. He must motivate and change plans and tactics at a moment’s notice and must motivate even when things don’t go well. He has to deal with defeat and disappointment and even unrealistic expectations and complaint. Few managers achieve the success that others crave for the club yet they must still carry on to the next match and the next season. Hopefully. So whether it is at East Stirlingshire or Manchester United I think football managers have something to teach us on clinical leadership. What do you think?